Bananas, cottage cheese, and wheat germ turn ordinary pancakes into a nutrition-packed power pancakes breakfast treat. In a medium bowl, mash the bananas with a fork or potato masher. Add the milk, cottage cheese, egg and honey and whisk to blend. In a separate bowl whisk together the flour, baking powder, salt and wheat germ. Add the wet ingredients to the dry all at once and mix gently just until incorporated; do not overbeat. Preheat a heavy cast-iron skillet or griddle over medium heat. Grease with butter, then pour on the batter, using about 1/4 cup per pancake. 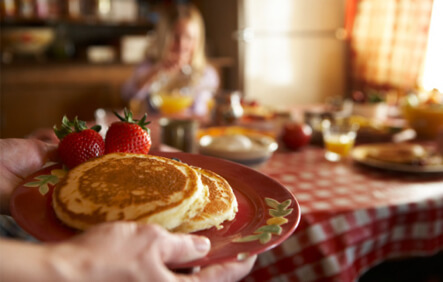 Cook the pancakes for one or two minutes per side, until firm to the touch and golden brown. Top them with your favorite yogurt and fresh fruit to make a complete meal.